Concept: All fall, Walmart, along with their CPG brand partners, Dr Pepper and Kingsford, will be traveling across country for the #FiredUpFans Truck Tour to stoke team pride. Objective: Drive brand loyalty for Walmart’s CPG retail brand partners; encourage in-store sales and acquire new emails. Walmart has launched a fun and educational new campaign to equip sports fans with new game changing BBQ recipes to try out during the fall tailgating season that feature two of their brand partners, Dr Pepper and Kingsford. 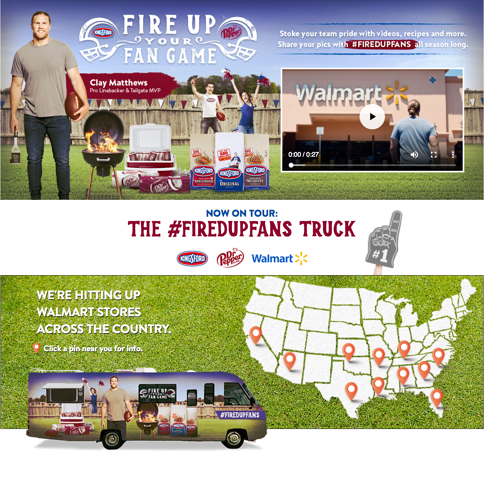 From now until December, Walmart will be on the road as part of their #FiredUpFans truck tour across the country, making stops in cities like Tulsa and San Jose, with Tailgating MVP and Pro Linebacker, Clay Matthews, to share some unique BBQ tips and tricks this football season. Walmart paired up their in-store experience with an online engagement and information hub, that features recipes to try, tips, videos, and an content gallery, where fans can share their own unique recipe and tailgating know-how using the #FiredUpFans across social media. Be sure to check out their campaign and keep an eye on where their #FiredUpFans truck will be next on their campaign website here. Keep reading for more details below on best practices you can incorporate into your digital campaigns to increase Engagement and Virality. Pick the right partners. Walmart not only partnered up with their retail brand partners, Dr. Pepper and Kingsford, but they also teamed up with Celebrity Linebacker, Clay Matthews, to give their campaign that extra push to bring consumers in and keep them engaging with their content. Add an interactive social map. Walmart added an interactive social map that displayed pins and information on upcoming events from across the country. Adding a visual map that displays the breadth of your campaign is a great way to encourage engagement through more campaign clicks and views. Combine photo and video. The popularity of video continues to rise and it is gradually becoming expected that digital campaigns feature some form of video content, whether as part of their UGC submissions or campaign landing pages. Until video completely takes over, it is a smart choice to include both photo and video to ensure your campaign is optimized to capture all submissions, especially if entries are being shared and collected using a hashtag on Twitter or Instagram. Include a hashtag for sharing and featuring. A simple way to increase sharing is to enable entry submission using a campaign hashtag on social or include a social content stream tied to a hashtag on your campaign’s landing page. Learn more about how you can add a social/content map to your next campaign here.